It’s the era of the eBook, but the unexpected return of some childhood Doctor Who novels shows how books themselves can act as personal time machines. This is the story of the 40-year journey of my childhood Target book collection. 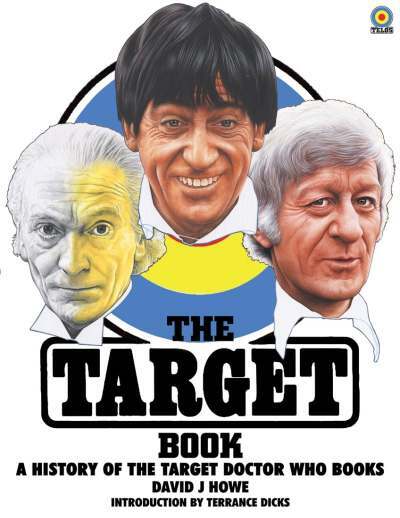 For the uninitiated, Target were a book publishing company who built a very successful business in the 70s and 80s, publishing ‘novelisations’ of old Doctor Who stories. This was a pre- VHS, DVD or Netflix world in which TV episodes were largely gone forever after broadcast. 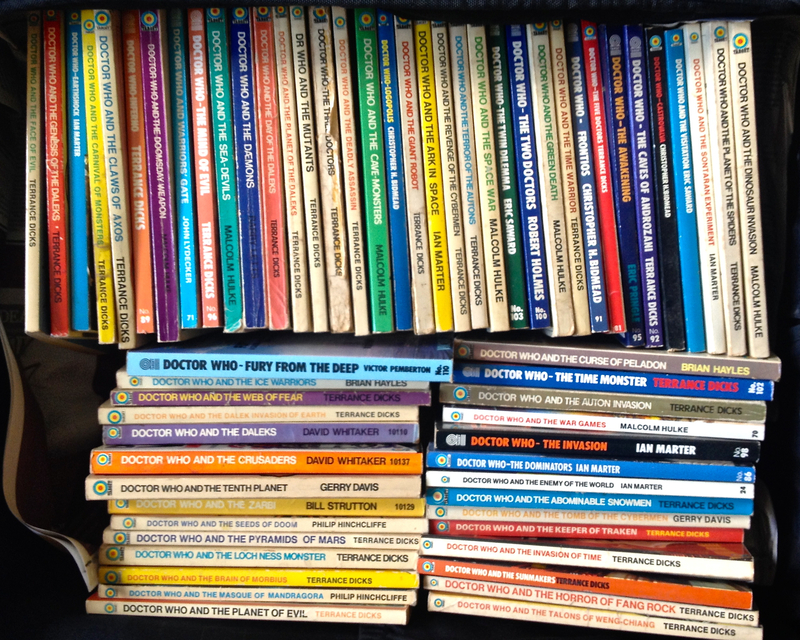 Doctor Who itself was only on for 25 minutes a week, with no stripped repeats on BBC3, Horror Channel or box sets to bridge the gap, so these novels were manna from heaven. 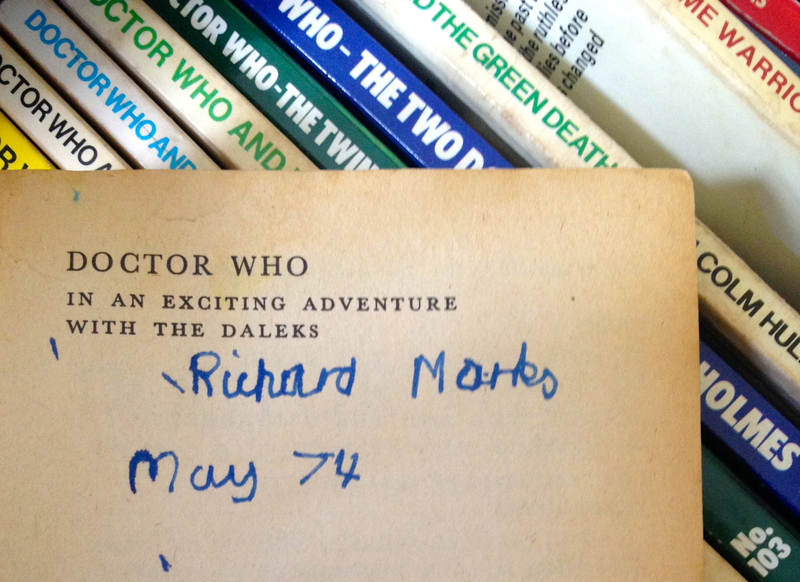 From 1974, when I was given the first trio of books, ten year old me was hooked. The Target Doctor Who range was immensely popular. 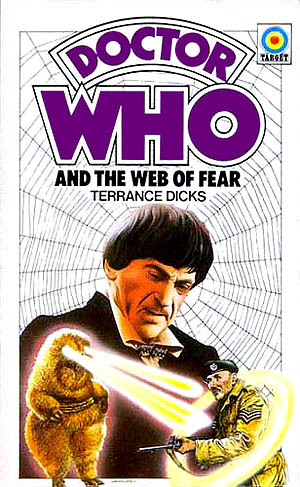 Over 150 titles were published and many of my generation, including members of the modern ‘Who’ production team credit the books with helping them to become readers in the first place (a young Steven Moffat is shown below). Our desire to experience these past adventures overwrote that childish aversion to reading for pleasure, whilst the simple but effective style of Terrance Dicks, their primary writer, struck the perfect note. 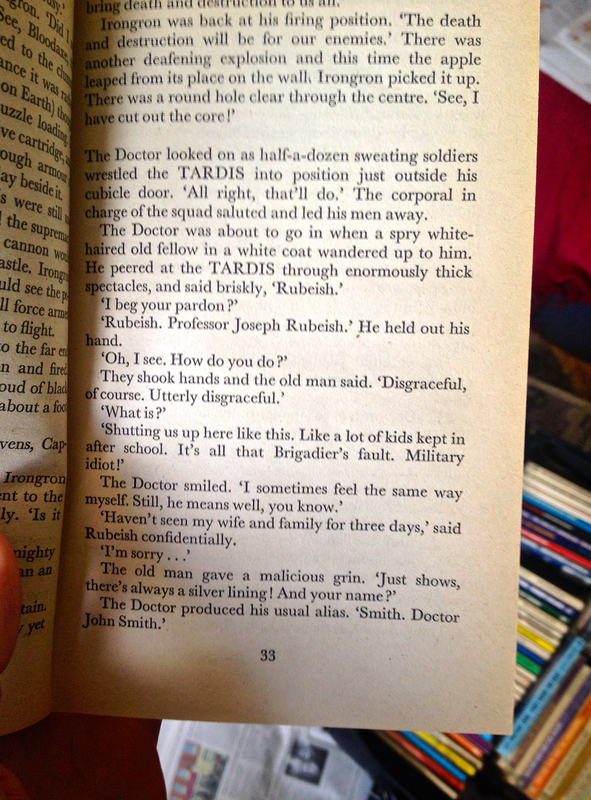 Indeed, when I had mentioned Target books to my cousin, with whom I had never had a Who-related conversation before, he waxed lyrical about borrowing them from the library, spontaneously recalling a passage he had enjoyed about a scientist called ‘Rubeish’ who the Doctor misheard as Rubbish. High comedy indeed. However, what most Target readers at the time did not realise was than many of the stories we were reading no longer existed at the BBC. The BBC junked many episodes in order to reuse expensive video and free up storage space. This decision is derided by fans as being completely shortsighted, but I do have some sympathy myself. I have to confess I was to commit a similar act of personal cultural vandalism. After collecting the first Target books I headed off to college and they gathered dust on my shelves. I still watched the show, but by the time I finally moved into my own tiny flat in 1993, Doctor Who was dead, cancelled in 1989 and with no likelihood of it ever returning. When, after three pints of Austrian lager in the Fitzroy Tavern, I heard that the young son of a friend’s brother was still – inexplicably – in love with Doctor Who, without a moments thought I said he could have them. So they departed in a box to who knows where. You see, dear reader, like the BBC and their film cans, I too had storage issues and thought the books had no intrinsic value. Ironically, I did not know that the pub we were in at the time was also the scene of monthly meet ups of Doctor Who fans during the ‘wilderness years’, including many future writers of the revived show. Sadly this was not the first Thursday of the month and there was no young Russell T. Davies or Paul Cornell to overhear and advise me otherwise. So off they went. Over the years various intrepid people have worked hard to return the missing Doctor Who episodes to the archives and, at the time of writing, the list has been reduced to a still frustrating 97. Meanwhile the show itself did return in glory to become a global phenomenon and BBC mega brand. Approaching 50 and still a Who fan, I regretted giving away a chunk of my childhood. I was consoled that they had hopefully inspired someone else as they had me, but had I been just as rash as the BBC junking film cans in the early 70s? It wasn’t about the monetary value: these were all first editions, but their eBay value would be diminished by my insistence on carefully writing my name on the inside cover and re-reading then many, many times. It’s the memories they invoked that I missed. I don’t keep a diary, so music, vintage TV and books work as my own personal memory box, transporting me to a specific time and place when I first read, watched or listened to them, be it Cool For Cats on pink vinyl or the final episode of Catweazle. To scratch the itch I acquired a glorious coffee table book of all the Target covers. Wistfully leafing through it was however a bittersweet experience, admiration for Andrew Skilleter’s stunning artwork and Terrance Dicks incredible productivity was tinged with nostalgia and regret. As a result of the shows revived success, some of the Target books have been reissued as revered cultural artifacts with introductions by the likes of Neil Gaiman and Stephen Baxter. It wasn’t the same, they were new and fresh and didn’t smell of memories. I particularly felt their absence in 2013 amongst the explosion of nostalgia in Doctor Who’s 50th year – there was even a Radio 4 documentary specifically about the Target books. Then, in September of the Anniversary year, a miracle. Not only were two missing stories found and available on iTunes, oh joyous day, but I received a call from my friend. His brother had some books in the attic he thought were mine. Did I want them back or should they throw them out? 64 Target novels were neatly packed in an Espresso machine box behind my friend’s sofa. They were in a remarkably good state. No sign of vinegar and all correctly labeled: no opening The Tenth Planet to find a Tomorrow People novel instead (OK perhaps I should step away from the missing episodes analogy now). Remembering my cousin’s love of Professor Rubeish, I guessed this was probably from The Time Warrior, in which a Sontaran warrior stranded in the middle ages kidnaps scientists from the 1970s (or possibly the 1980s, but don’t go there) to get him home. I picked it up and there on page 33 was the exchange. So the books are back, but the cycle continues…. Another close friend was having problems encouraging his Who-obsessed ten-year-old to read. Even a Kindle hadn’t done the trick. A Kindle? That’s soulless technology! What he needed was some vintage Terrance Dicks or Malcolm Hulke to get him hooked on reading. So I lent (definitely not gave!) three Target novels encased in plastic book protectors. Let’s hope they captured his imagination in the same way they did a young Steven Moffat or Peter Capaldi all those years ago and show there is a life outside of Minecraft and Match Attax. It was tricky picking titles for a boy who thinks the Silence aren’t scary at all, but is inexplicably traumatised by the sight of the Abzorbalof. I went for Invasion Of The Dinosaurs, Genesis Of The Daleks and The Ark In Space. Meanwhile the recovered trove serve as my own personal time machine, taking me back through the time vortex to reading ‘Tomb Of The Cybermen’ in my Granddad’s house in Shoreham By Sea (I can hear the birdsong in the street outside even now) or ‘The War Games’ under my desk before an A Level history class (sorry Mr Jones but it was about World War 1 and better than Wilfred Owen). Both are more powerful memory imprints than when I actually got to see those episodes when they were eventually returned to the BBC archives and restored on shiny DVD. That’s because there’s no more powerful combination than a child’s imagination and the inside of a good book. Great article, I shall pass it on to my brother. ..and do thank him again for two decades of storage! I’m a 64 babie too! And I did the same thing as you, gave my target collection away! Ah that 17 year old should have his bum kicked! I have all the target novels back, care of eBay and the originals as well! 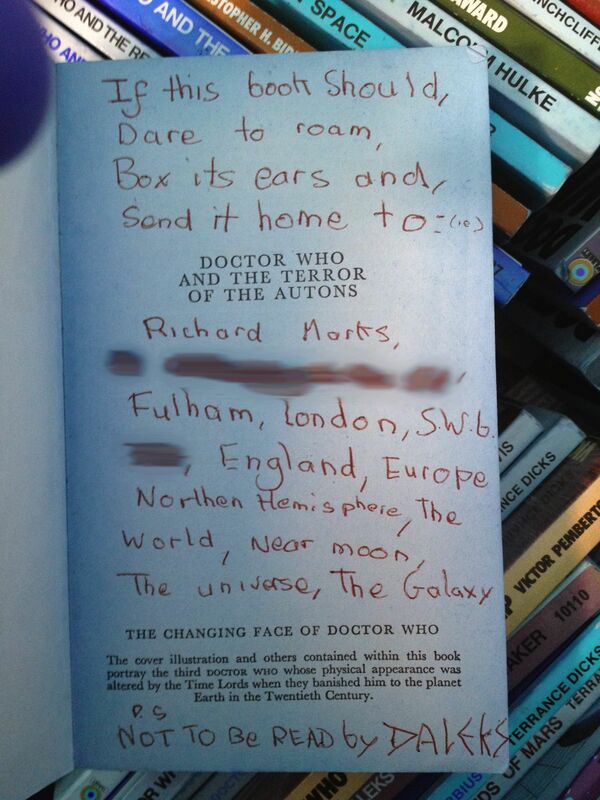 I kept my first ever target novel, the planet of the Daleks though. I would recommend giving your freibds son the first three novels released, the daleks, the crusades and the Zarbi. So well written and I’m sure the lad will be smitten! Thanks for the advice, all three were ones that I read decades before I actually got to see them – well two and a half of them anyway! I well remember my first two Target books which I got from Stubbington library. They were The Tomb of the Cybermen and The Monster of Peladon. The covers were superb. Now that DVD has allowed us to see the stories, is it heresy to suggest that the books were often better than the show? As for books to get someone started, I would go for Death to the Daleks with its stunning opening line or maybe Image of the Fendahl for its gothic horror storyline. The cover of Fendahl is terrible though (and it was the first book I actually bought). People forget today that it wasn’t always easy to find the Target books, especially if you lived out in the sticks like I did. Not heresy – certainly Monster of Peladon is a let down compared to the novel. Tomb features my favourite Who music, so just shades the book. You could argue that there is a parallel between the black and white vs colour eras. Black and white had lots of shadows which you were able to fill with your imagination, just as books also allow you to imagine that Aggedor is something more than a man in a black carpet, or Alpha Centauri a shower curtain wrapped around a beach ball. Sometimes less is more even in the era of HD. That’s one of the reasons I enjoy the Big Finish audios so much as the special effects in my head are state of the art! Classic description of Aggedor! He he. The covers were so good too – The Carnival of Monsters was so cool! Even as I read your heart warming account of the return of so many prodigal sons, one of my own (Harrison Lloyd Douglas Mouldycliff, ‘Bobby’ to his family) has discovered yet another of your long lost tomes on his bookshelf nestling next to a clutch of Dr Who books of a more recent vintage. “Divided Loyalties” by Gary Russell is a Fifth incarnation adventure featuring the Celestial Toymaker and will I hope in the fullness of time be repatriated alongside its contemporaries, courtesy of my brother. Glad to have been the instigator of such happiness and rediscovered childhood. Good heavens. I am aware of the book but have to confess its not one of mine. It was actually published when they ran out of TV stories to novelise so wrote their own in the ‘wilderness years’ as they were called. I suspect if you look at the spine it will say ‘BBC Books’ as opposed to Target, but i could be wrong. In some ways that presaged what they do with the new series now – in the DVD era they don’t novelise the TV adventures at all but have spin off stories. Happy to have it nonetheless if Bobby has no use for it. Many thanks again and by the way I enjoyed looking at your website, the ambient music reminds me of some of the recent art house film soundtracks that Matt Johnson did after The The.